Coordinating the processing of visas, assisting with the paperwork for work and residence permits and obtaining passports are complex tasks. Reindeer Station professionals, who are local experts, help clients understand the complexities and simplify the process. Upon receiving word of an immigration requirement, Reindeer Station will proceed to obtain all the relevant immigration approvals and accompanying family to work, reside and study in the host location. All immigration services will be in accordance with local laws and regulations. Regulation of the People's Republic of China on the Administration of the Entry and Exit of Foreign Nationals started to implement officially on 1st July, 2013. The latest China visa categories as bellowing for your reference. As a crew member or a motor vehicle driver C Issued to foreign crew members of aircraft, trains and ships, motor vehicle drivers engaged in cross-border transport activities, and also to the accompanying family members of the above-mentioned ships'crew members. 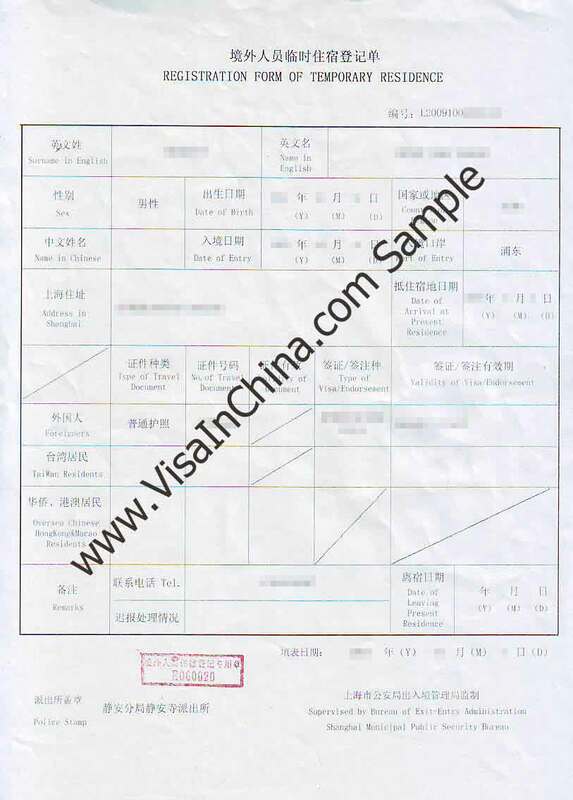 Validity Validity of a visa refers to the period that the visa holder is allowed to enter China. Unless otherwise specified, a visa holder may enter China at any time prior to expiry of validity (right up to midnight Beijing Time on the final day of validity), so long as the entries granted on the visa have not been used up. Chinese embassies and consulates general do not extend the validity of an issued visa. A fresh application is needed after the expiry of the issued visa. Foreigners holding an expired visa seeking entry will be refused. Make sure the visa is valid before you set off for China. However, even if a foreigner holds a valid visa, he or she might be refused entry by the immigration authorities. Q: I hold a double entry visa valid until June 20 and the first entry occurs on June 12. Can I come to China again for the second entry on June 25? A: No, you will be refused to enter China as the visa had expired before the attempt to use the second entry. Number of Entries of a Visa The number of entries of a visa refers to the number of times the visa holder is permitted to enter China within the visa’s validity. When the entries are all used up, the visa is no longer valid. Even if there are still unused entries, the visa is not valid either if its validity has already expired. In either case, the visa holder should apply for a new visa if another visit to China is planned. An applicant will be refused entry to China if all the visa entries have been used up. Q: I hold a double-entry visa valid from March 20 to June 20, and have entered China twice before May 20. Can I continue to use this visa again before June 20? A: No,you have used all the entries permitted by the visa. Duration of stay of a visa refers to the longest period the visa holder is allowed to stay in China from the day following entry to China on each visit. Q: I hold a single-entry visa with duration of stay of 30 days, and enter China on June 12. When is the last day I can stay in China lawfully permitted by the visa? A: The last day is July 12 as the duration of stay is counted from June 13, the day after entry. Q: I hold a single-entry visa for a stay up to 30 days and validity until June 12. If I enter China on June 12, the last day of validity, can I stay in China for 30 days thereafter? After entry into China, a foreign citizen who needs to stay in China longer than the duration of stay permitted by the visa must apply for an extension of stay at a local public security bureau before the original permitted period of stay expires. This does not necessarily mean your application for an extension will be approved. The applicant shall bear any consequences arising from this situation. Overstay in China violates the country’s laws and regulations on control of the entry and exit of foreigners, and could result in a fine or other penalty. L/ F /M/S visa 7 Extension 500 It’s different price with different nationality. If you need speed service on visa application, please check with our consultant for details. Please be noticed that a visa is a sovereign act of a country and those who are qualified for visas don't necessarily mean the availability of visas. 1. On the condition that it's the first time for you to apply for the work certificate, it's essential for you to return to your mother country with the work permit from Chinese government and go to the Chinese embassy there to apply for Z visa. After that, come back to china with the Z visa you obtained and start applying for work certificate. 2. When applying visa for your family, please make ready for the marriage certificate or birth certificate, depending on whether it is for your spouse or children. From July 2008, the government has a new regulation telling that the latest local registration certificate is needed when applying for visa. The latest temporary residence is the one that can show your latest entry. Please make sure sufficient time is left when applying for the visa, because your passport will be kept at the government bureau during the visa application. For the people who has residence permit now (Purpose: work, study, family), when you move to a new address or change a new passport, you have to re-register. For the people who has none residence permit now (L visa, M visa etc. ), when you leave China and re-enter, you have to re-register. Notice: If you register yourself too late, maybe the police will charge you fine. Please notice as the regulation, the fine is from minimum 0RMB(warning) up to maximum 2000RMB.